Advance Equipment Services (HK) Ltd.
AES Steel Mould (Hong Kong) Ltd.
Advance Equipment Services (HK) Ltd. was incorporated in Hong Kong on 22 July 1988 and involves in the design, manufacture, erection of steel scaffolding. 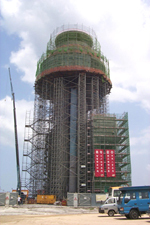 In 1995, the Company was appointed as the sole distributor of the Crab System Scaffolding for Hong Kong, Macau area and Guangdong province of PRC. The Crab System Scaffolding is a patented design developed by Entrepose Echafaudages of France. It is an advanced system which conforms to the European Safety Standards and is particularly suitable for the construction work, ship building, the oil and gas industries. Now, Advance Equipment becomes one of the largest steel scaffolding companies in Hong Kong. Our own manufacturing facilities and our coordinated manufacturer produce the equipment under strict quality control and inspection. Our modern, storage and distribution facility ensures the stock is always available for immediate delivery and is continuously being replenished. ©Copyright Advance Equipment Services (HK) Ltd. Powered by IGEARS TECHNOLOGY LIMITED.